Live Life fully alive. Be awesome. Be terrific! My wife Vaani and I have been telling Dasrath Manji’s story, for eight years now, in all our workshops. We inspire and invite managers to learn from Manjhi’s tale of grit and focus no doubt, but we also help them connect with another key learning – living a Life of Purpose. Manjhi found his Life’s Purpose, to break down the mountain in the Gaya district of Bihar, which separated his native Gehlaur from the nearest town Wazirganj. Until Manjhi’s feat, his village-folk had to either climb the 25ft-high mountain by foot to cross it or had to go around it, taking a circuitous 55 km route. Manjhi broke down that mountain with just a hammer and chisel – he did it alone, over 22 years! A feat that is unparalleled in human history. The road Manjhi helped pave between Gehlaur and Wazirganj reduced the distance between the two places to 15 km! 1. Manjhi’s mantra of “Shaandaar! Zabardast!! Zindabad!!! – Terrific! Awesome!! Alive!! !” is very inspiring. This what Siddiqui’s Manjhi (not sure if Manjhi Original ever spoke those words) tells anyone who asks him how is he doing. He is shown soldiering on against a remorseless mountain in inhuman conditions, but every time someone stops by to ask him how’s he doing, he has only the mantra in reply – “Shaandaar! Zabardast!! Zindabad!! !” It is an infectious mantra no doubt. And something we can practice in our daily lives too. 2. Mehta’s film shows us how Manjhi too faces his dark moments. When he thinks he cannot go on. When he finds the world out there is cold, its people beastly and inhuman and the mountain unrelenting. But then this is the time when Manjhi dips into his inner being. This is where he meets his Phaguniya who eggs him on to last one more day and to plough on. We too face our mountains. Our mountains are often mere molehills, when compared to Manjhi’s, but we imagine them to be insurmountable peaks standing obstinately in our way. So we too crumble. We too want to badly cry out of the game. We too say we can’t go any further. 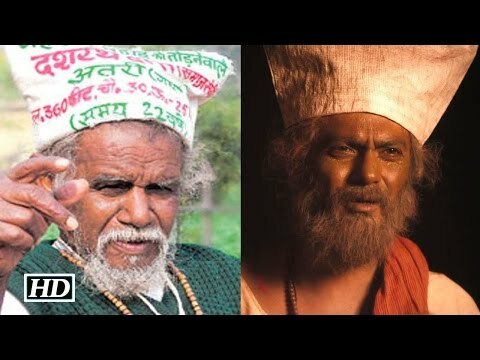 And that’s when, as this film points out, we must invest in Manjhi’s method of looking within. When we seek within, we will find the energy, the motivation and the reason to plough on – in any context or situation we may find ourselves. Remember: if we listen to what the world has to say, we will get nowhere. The world has only opinions. But the Universe is full of energy. And it is the same energy that powers the Universe that powers you – and me – too. So, when we dip into that energy, we will always find a way to move forward. I am not sure you or I will have a chance to, or may even want to, break down a mountain like Manjhi did. But if we can learn from the Mountain Man’s Life to be terrific, be awesome, be alive to Life, every single day, and live a Life of Purpose, well, we would surely have lived this lifetime more meaningfully than we are doing just now! Author AVIS ViswanathanPosted on September 1, 2015 March 14, 2016 Categories Art of Living, Dasrath Manjhi, Gehlaur, http://schemas.google.com/blogger/2008/kind#post, Inner Peace, Intelligent Living, Manjhi: The Mountain Man, Nawazuddin Siddiqui, Purpose, Serve, WazirganjLeave a comment on Shaandaar! Zabardast!! Zindabad!! !